Let’s just say that when packing for school, I’m not The Minimalist. I stuff my suitcases within an inch of their polyester lives. Unfortunately, if you’re flying to school from hundreds of miles away, you’re often limited to a single suitcase; the fluffy boyfriend pillow and comforter will have to wait. Here’s a realistic approach to packing your essentials into one bag and shipping the rest. To start, pick a suitcase that fits regulations. Most airlines allow one personal item and a carry-on (max 9 by 14 by 22), besides checked luggage. 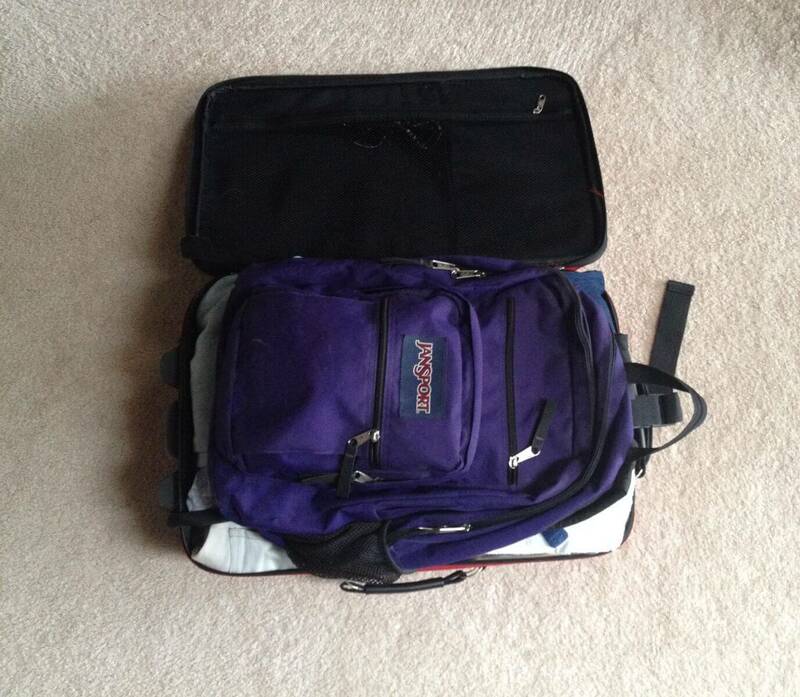 Sticking to just a carry-on is a great way to save money and avoid the back pain that comes from extra luggage. Travel-sized toiletries (shampoo, body wash, toothpaste, etc.) Remember: 3 oz. maximum. These essentials aren’t set in stone, so play around with them based on your personal needs. When choosing clothing for your carry-on, pick clothes that match anything, as this allows you to wear a pair of pants several times in a week. If you’re grossed out at this idea, just wait until winter rolls around—you’ll fall in love with one pair of sweats and wear them for weeks. And just in case you spill your dining hall drink on one of your few shirts, that handy TIDE to-go pen will be useful even without a wash cycle. 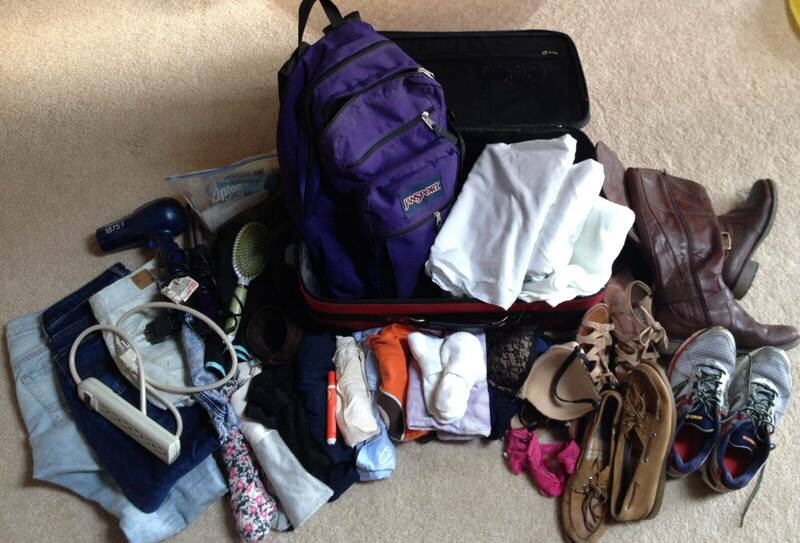 To start packing, put shoes and bulky items on the bottom. Think puzzle, and put the items where they fit best. This maximizes space and keeps delicate items from getting crushed. After the bulky items come pants. 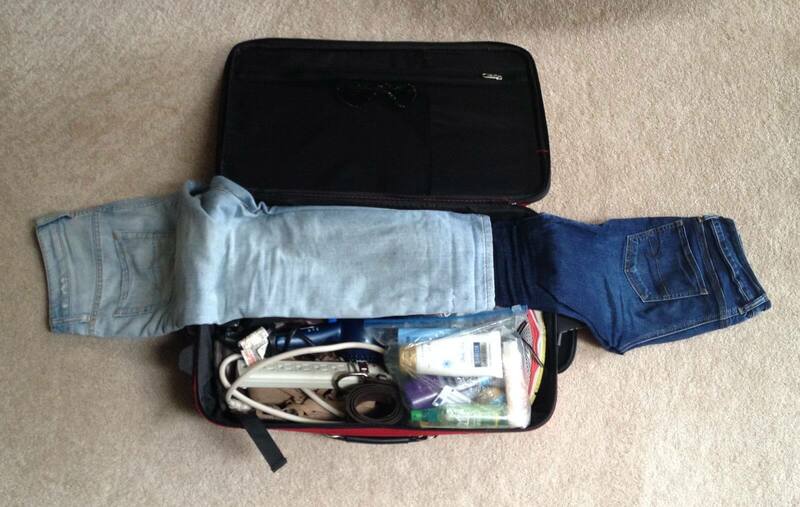 Put the middle to bottom half of the pants inside the suitcase. When you have multiple pairs of pants, this trick leaves room for other items. Next up: shirts, pajamas, underwear and shorts. 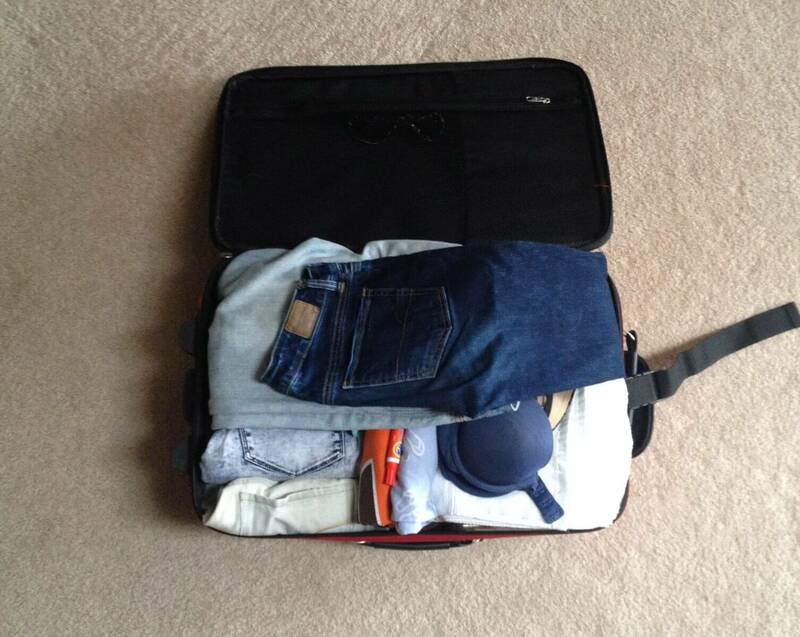 Roll up each pair of shorts and each shirt to fit on one side of the suitcase. This leaves the other side completely empty for your towel, sheets and underwear. Simply lay the towel and sheets on top one another and, if you have some wiggle room, you can stuff underwear down into the sides of your suitcase. Finally, take the overhanging flaps of your pants and fold them into the suitcase. This method keeps your pants from wrinkling and prevents the top of the suitcase from bulging upward if they were stacked on top on each other. You can even try to fit your backpack on top of everything if you want a different personal item on the plane. Maybe you’d prefer an over-the-shoulder computer bag filled with few books and a laptop to keep yourself entertained on the flight. Last but not least, close that sucker up. A cheesy but effective way to zip the sides is to sit on top and then work each zipper slowly. If it sticks, don’t force it! You’ll most likely separate the metal track from the zipper. If this unfortunate event occurs, you’re up you-know-what creek without a paddle and have to start the process all over again. 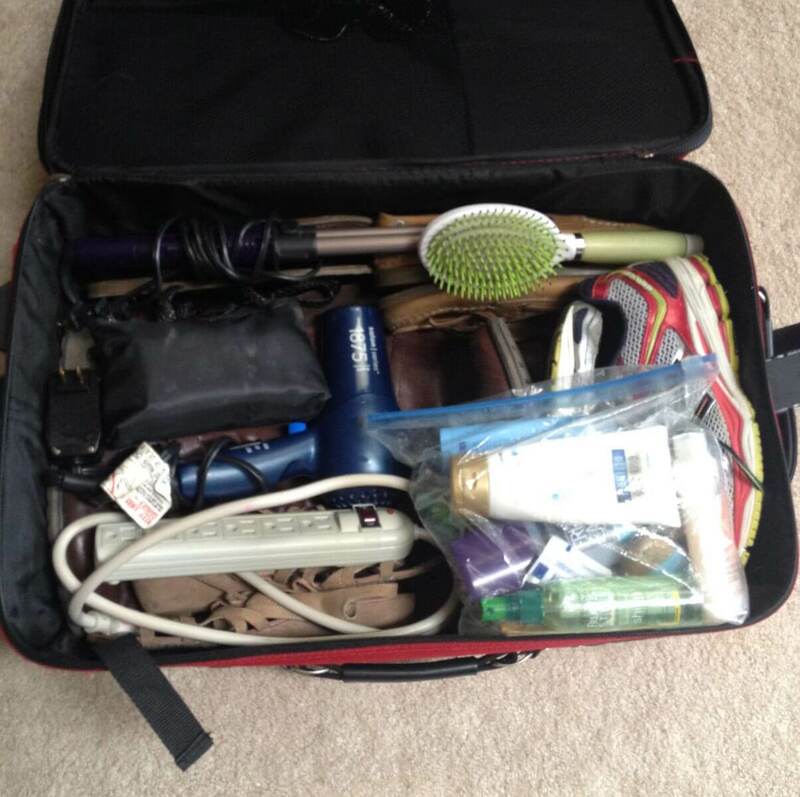 Try focusing on one side at a time while gently pushing in your belongings when the zipper comes around. Or if things really aren’t fitting, take advantage of vacuum-seal storage bags. After helping you fit more clothing options in your suitcase, they provide clothes storage in your dorm. Because let’s face it, that one chest of drawers and closet hardly fits half of your wardrobe. Before leaving, finalize how your bigger items will get to you. Collegeboxes.com offers inexpensive and hassle-free options. Beginning as a student-run operation out of Duke University, Collegeboxes.com provides boxes & supplies, pickup, storage, delivery and shipping to and from colleges internationally. With registration and shipping fees, you could have three 24 by 18 by 16 boxes shipped to your school for less than $150. They also offer storage options, so your bigger items can stay near your school even when you’re not. 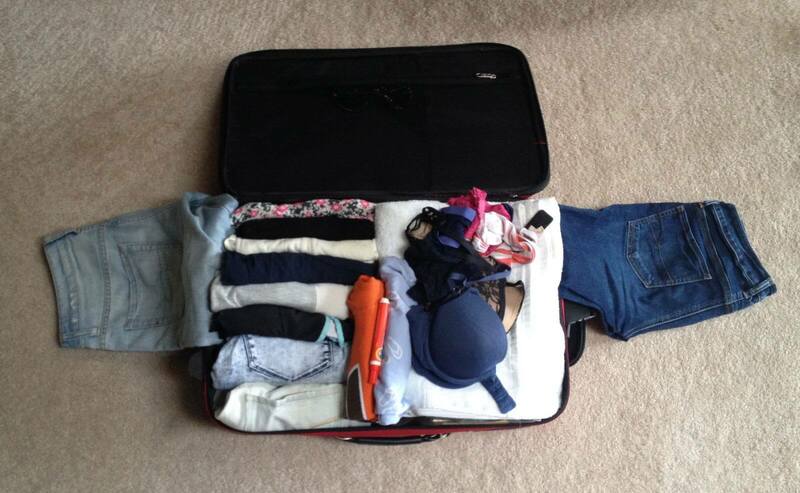 This will relieve your packing stress for next year and give you time to get the one-suitcase method down packed.